A question I’ve received over and over again the last several months is what I eat during the week, and whether I could share a food diary on the blog! I’ve shared my favorite recipes from time to time (like these Whole30 go-tos), but have never really given you an inside look at my schedule and day-to-day eating habits. I thought it might be fun to share a typical five-day food diary of what I usually eat when I’m cooking for myself at home. Every week is different with various social engagements, so it’s not always this regimented, but when I can cook for myself these are the things I gravitate towards. I generally try to maintain a paleo diet (aside from cheese – can’t live without it!) when I’m eating at home, which gives me a little wiggle room if I want to splurge on the weekends when dining out with my friends or when I’m traveling. Breakfast: Chia seed pudding with mixed berries + coffee with unsweetened almond/coconut milk creamer. What’s great about the chia seed pudding is you make it the night before and it’s ready to go when you wake up the next day! This recipe makes two full mason jars of pudding, and I usually only eat half of one jar for breakfast – if you use the cans of coconut milk as the recipe suggests, it’s very creamy and filling, and you definitely don’t need to eat the entire jar in one sitting! It keeps for several days, so I’ll usually eat half a jar each day for four days. Lunch: Mixed green salad with half an avocado, a fried egg, goat cheese crumbles and a slice of bacon chopped up. Toss in a balsamic + olive oil dressing, and sprinkle with black pepper and red chili flakes. Dinner: Beef + veggie taco mix in lettuce wraps. I have made this recipe nearly every week since I started Whole30 back in January! It’s so easy and so flavorful, and I’ve finally tweaked it to perfection. Here’s what I do: first brown the beef in a large skillet, then remove the meat from the pan while leaving the juices there for cooking the vegetables. Add all the chopped veggies (I usually use one small onion, diced carrots (get them pre-chopped at Whole Foods and use half the container), 2 poblano peppers, 1 green bell pepper, and 1 red bell pepper) to the pan with the juice leftover from cooking the beef and sauté for 5-10 minutes until the veggies get tender. Once the veggies are cooked to your desired texture, throw the beef back in. Add in the garlic, salt, cumin, chili powder and red pepper flakes, stir well and cook for another 3-5 minutes. Remove from heat, top with diced avocado and serve with lettuce wraps. These make incredible leftovers – I usually eat them for the next several days until I run out, with everything from mixed greens to avocado halves. I bet they’d be amazing on eggs too! Breakfast: Eat the second half of chia seed pudding jar (still on the first jar!) with mixed berries + coffee with unsweetened almond/coconut milk creamer. Lunch: Spinach salad with goat cheese crumbles, sliced strawberries, and cashews. 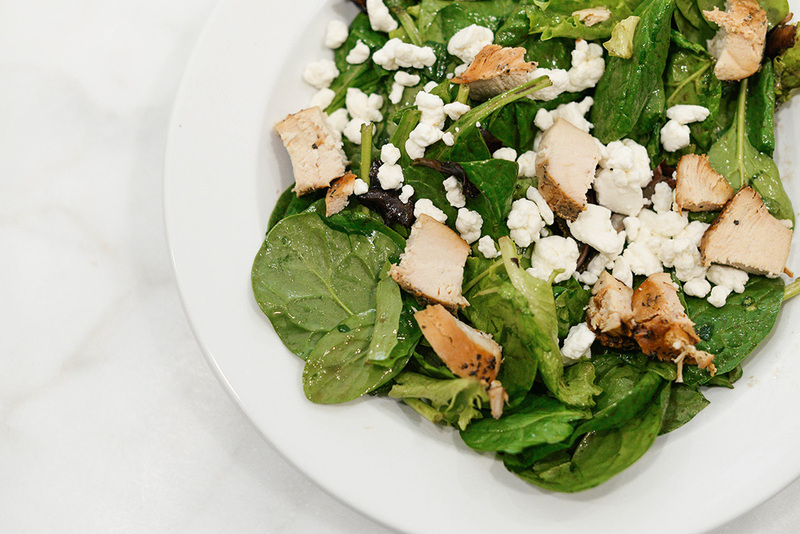 Toss in a balsamic + olive oil dressing! Dinner: Leftovers of beef + veggie taco meat in lettuce wraps, on avocado halves or on mixed greens. Breakfast: Chia seed pudding with mixed berries (half of the second jar). Lunch: Mixed green salad with diced chicken (I usually bake two of the pre-marinated filets from Whole30 the night before to eat throughout the week – the black pepper marinade is my fave! ), topped with goat cheese and tossed in a balsamic + olive oil dressing. Dinner: Cauliflower pasta. Back when I first decided to remove super starchy foods (aka carbs) from my diet, I was on the hunt for a healthier alternative for my favorite indulgences: pasta and pizza. I discovered this recipe for cauliflower crusted pizza and made that first, which is what gave me the idea to do a little recipe testing of my own. I really loved the cauliflower crust and didn’t miss the bread, so I thought I’d try to make pasta using cauliflower as well! It took a few attempts to get it right, but this cauliflower pasta recipe has been a go-to ever since. It’s literally the easiest thing: you just chop up the cauliflower, roast it in the oven, and then toss it with marinara. You can also add any topping like chicken, Italian sausage, to throw in a protein if you want! It’s a great dinner for one person – I usually end up with very little leftovers, but it definitely depends on the size of the cauliflower you get. Snack/Dessert: Apple with almond butter. Breakfast: Chia seed pudding with mixed berries (second half of the second jar) + coffee with unsweetened almond/coconut milk creamer. Lunch: Kale salad with sliced apples, dried cranberries or cherries, goat cheese crumbles, and chopped almonds. Toss in an apple cider vinaigrette. Option to throw on sliced chicken, but I love it without the meat. Dinner: Scrambled eggs, bacon, half an avocado and sauteed spinach. I love a good breakfast for dinner situation! This is the one I usually throw together – it’s easy, features protein, veggies and healthy fats and has a lot of flavor. It satisfies that craving for something bad too! Breakfast: Cook hot pork breakfast sausage patties to eat over the next few days for breakfast with fruit. I usually just buy Jimmy Dean’s hot pork sausage! It’s a nice way to spice things up (pun intended) for the weekend and throw in a more savory breakfast for a few days before I start with the chia seed pudding again. Coffee with unsweetened almond/coconut milk creamer. Lunch: Mixed green salad with the leftover diced chicken, sliced tomatoes, avocado, and mozzarella. Toss in a balsamic + olive oil dressing! What brand/type of bacon do you prefer? Thanks! I normally buy Pederson’s Whole30-approved (no sugar added) bacon at Whole Foods! i have low iron so i need more leafy greens in my life… these salads sound tasty and easy for work!